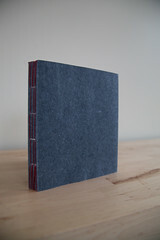 Last semester I took Book Binding I through the University of Iowa Center for the Book . What an amazing experience – excellent instructor, supportive work environment, and talented, interesting students! 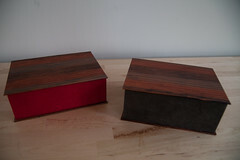 The fruits of my labor (besides the ones I gave away) are posted here. 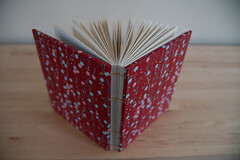 Book binding requires great attention to detail (not always my strong point) and lots of uninterrupted time to focus on the work. So, carving out enough time to get things done with two little gumbos underfoot was a little tricky at times. Every now and then in a mad dash to get things done under deadline, I would work with the kids around. 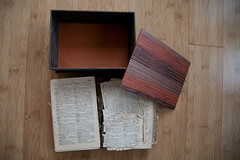 As you might imagine, they took a real interest in the “book finding,” as Eliott called it. 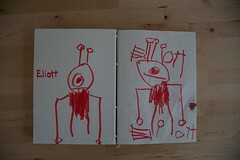 Here’s some of Eliott’s fabulous pictures from his books. Of course there’s lots of elaborate narrative that goes along with them. . . This robot is named Eliott. 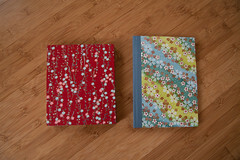 It is really cool to see how the books covered in origami paper turned out! 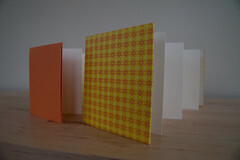 All of your books are beautiful. 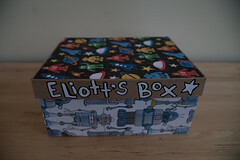 Love Eliott’s box! !